Cuba was definitely an interesting country to visit. I have been to a Communist country before — I visited the USSR in 1983 — so I had some expectations that proved to be accurate. Lots of political and ideological slogans were plastered all over the place, on billboards, building walls, buses, even inside stores: ¡Venceremos! ("We will succeed! ", with a photograph of young female ballet students), Patria o muerte ("My country or death"), Nuevos retos, nuevos victorias ("New challenges, new victories"), Sin cultura la libertad no es posible ("Without culture, freedom is impossible"), Solo la voluntad humana podrá salvar el mundo ("Only human will can save the world"), and even a photo of Fidel Castro and Che Guevara in a (state-owned) rum and cigar shop. 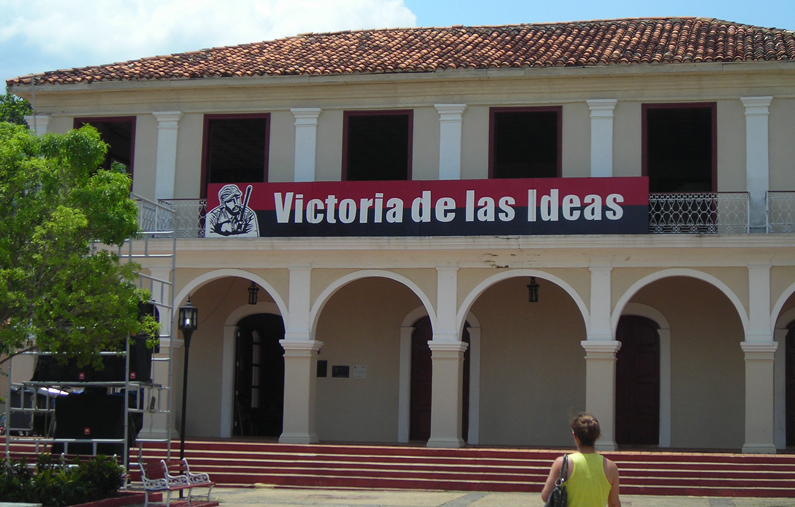 One slogan I particularly liked was La palabra enseña; el ejemplo guía ("Words teach, but examples lead"), credited to Che. I also expected to hear a lot of political rhetoric, and I was not disappointed. As I mentioned in Part 2, one site the group visited was a cooperative organic farm. The president of the cooperative lectured us for 45 minutes about how the work they were doing was helping the country, how everyone worked together, how the U.S. could learn lots of valuable lessons from them, ad nauseum. The one surprise was when he said that Cuba is facing a problem because the fact that all citizens' basic needs are met — everyone has housing, healthcare, education, and basic food provided — means that people don't have to work, and some people actually choose not to. Of course, he didn't respond to any questions following up on that point, and didn't answer several other questions that apparently touched on other questionable topics, but instead simply "answered" about totally unrelated subjects. The coop president spoke in Spanish, and our tour guide interpreted for him. I was able to follow along with what the president said and then compare how the guide translated. At one point he made a comment about the problems with democracy, but the guide translated it as problems with individuals. Our tour guide was generally very good at phrasing things so that they didn't stray from party ideology. She chose her words carefully when describing potentially volatile subjects. She obviously didn't want to alienate the group on which she was dependent for employment and gratuities, and I also got the impression that for the most part she believes in her country's system. But for all her talk, not only is she working as a tour guide to supplement the income she receives from her position as a university professor ($50 each month, we were told), it seemed that she was likely getting kickbacks or some kind of percentage cuts from vendors, even going so far at one establishment to ask a clerk how much members of our group had spent. It appears the capitalist spirit is doing well in Cuba, even among the party faithful. The bus we traveled in was from Transtur, which seemed to be the official government tourist agency. 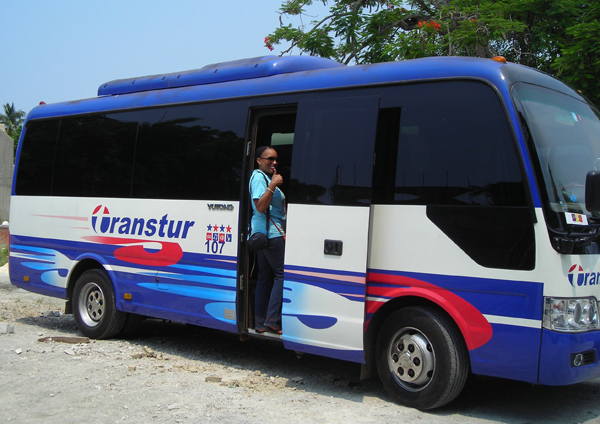 We saw Transtur buses in many of the places we went. This reminded me of going around the Soviet Union with Intourist, the official state tourist agency there. 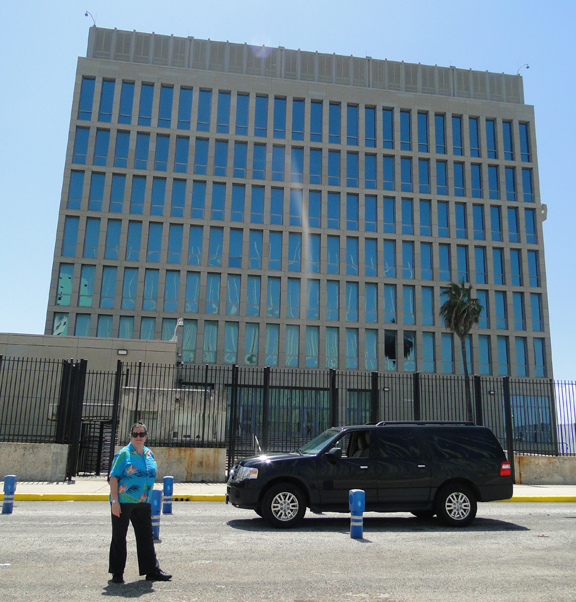 I never had the impression in Cuba that we were being watched, however, while in the USSR many members of that group were pretty sure we were followed and watched a good portion of the time. Other experiences, however, were more of a culture shock. There seems to be some sort of (unwritten?) rule that women in Cuba must wear impossibly tight clothing. Almost all women wore extremely tight pants (usually Spandex), no matter how narrow or wide they were, and pantylines be damned. This included police officers (super tight slacks with high heels) and even customs agents at the airport (would you believe two women wearing Spandex and tank tops? yes, they really were customs agents). Tops also were very tight and stretched to their limits. Some professional women, such as officers and hotel employees, substituted very tight, very short mini skirts for the Spandex pants. They usually wore suit jackets and blouses instead of the ubiquitous stretch tops. Some of the customs agents wore mini skirts with patterned stockings. 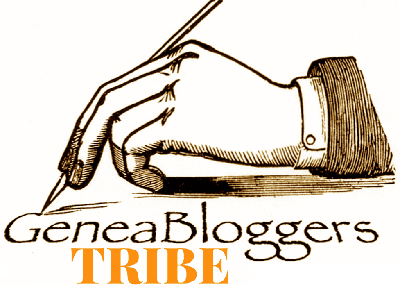 As I tend to wear loose, comfortable Hawaiian shirts and jeans, I stood out like a sore thumb. For men, somehow the baggy pants look was imported and is very popular. Sorry, Cuban men, very few of you could get work as underwear models. Cuban food was somewhat disappointing. I already knew that Cuban cuisine is not particularly spicy, but I wasn't expecting totally bland. Salt and pepper seemed almost unknown in prepared food, and herbs were equally nonexistent. Most of the food tasted adequate but uninspired, and we saw the same dishes in multiple places. I don't know if the dishes and preparation styles were truly "authentic" or merely what is offered to tourists. The best meal we had was in a private home. Through a complicated connection that began when a man tried to escape from Cuba and was rescued by people in the Dominican Republic, we were given the opportunity to have dinner with a family in their home. The matriarch made the best chicken croquettes (one of those dishes we saw multiple times) we had all week, along with Cuban tamales (much moister than Mexican style), tostones (double-fried plantains), pork and veggie stew, fried ripe plantains, roast chicken, stewed yucca, fresh avocado, and shredded coconut and cheese for dessert (which may sound odd but was very tasty). Our guide did not come with us to this dinner, and I became the interpreter, dredging up the Spanish I haven't used on a regular basis for more than 30 years. They didn't kick us out or look offended, so I must have done ok. Most of the buildings I saw appeared to be sturdily built but falling into disrepair. The phrase "shabby gentility" came to mind. This applied equally to residential, commercial, and government buildings. Paint was peeling, pieces of exteriors were missing (most buildings in the city appeared to be made of concrete, though in the country I also saw uneven clapboard, bare corrugated metal, and cinder blocks). Many residences looked as though they had been through fires. Some houses had pieces missing from the roofs but were still occupied. Many buildings were obviously too damaged for use but were not fenced off, simply abandoned. Fences often seemed to have been made from whatever materials someone could find; I saw wood slats, broken tree branches, cardboard, and other opportunistic items filling in spaces in bare wire. Something else I noticed about buildings was that almost universally, ground-story doors and windows had heavy-duty bars, and many second-story windows had bars also. Government buildings did this one better: Instead of bars, they had those roll-down doors (like in warehouses) that cover windows entirely. So even though there doesn't appear to be a problem with personal safety — the women in our group walked around even late at night and nothing happened — I'm not so sure about property crime. There was trash everywhere — in the city, in the country when we went to Viñales, everywhere. There was also graffiti all over Havana. It was a very dirty city. As I remember Moscow being very clean, I was not expecting this, but it has been three decades. Maybe Moscow is dirty now also. Animals that Americans think of as "pets" were in very poor condition in general. Though some people had dogs on leashes, and those dogs looked well taken care of, they were the exception, and cats and dogs usually looked scrawny and underfed. Ribs, hip bones, and shoulder bones often were easy to see beneath the skin. Neutering animals does not appear to be a popular thing to do, because pretty much every male dog and cat we saw was fully intact (thereby helping increase the populations of those dogs and cats, of course). 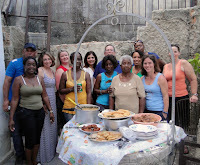 One interesting aspect of Cuban culture our tour guide explained to us was race, or rather the lack thereof. In Cuba the government policy is that everyone is mixed race, so race is not used as a classification. On driver's licenses, "black", "white", and "mulatto" refer to skin color, not race. The guide also mentioned that someone's skin color is subjective and can easily vary by time of year and how much the person has been in the sun recently. During our visit to the artist's studio, I noticed two rainbow flags incorporated into the artwork. 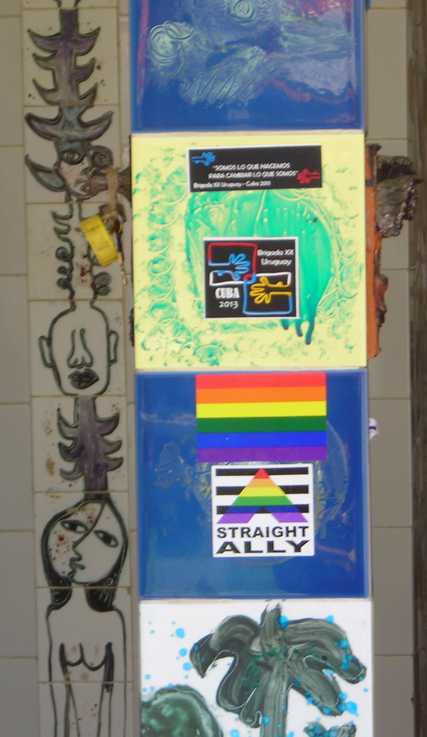 Our guide told us that the government's official stance on the LGBT community is acceptance and accommodation. Most roads were in awful condition, including the major highway we traveled on to go to Viñales. The speed limit on the highway wasn't very high, most of the time topping out at 60 kph (about 35 mph). For some short stretches, it actually got up to 80 (50), 90 (55), and even 100 (60) once. But we'd be zipping along, and suddenly the driver would start hitting the brakes, slowing down gradually to almost a crawl, so he could avoid yet another pothole spanning the width of the lane. Beyond the condition of the road, I think one of the reasons for the relatively low speed limits is that the highway has to accommodate not only cars and buses but also more old-fashioned transportation. During our three-hour trip west I counted nine pairs of yoked oxen and sixteen horse-drawn carts that used the highway. A confusing sight along the highway were overpasses that didn't connect to any roads. I never learned whether they were roads that hadn't been completed, roads that used to exist but had been destroyed, or built that way deliberately, perhaps as shade for hitchhikers. Our guide had told us that hitchhiking was the national sport, and a lot of people used the highway to bum rides. But it gets really hot during the day, and being able to take shelter under those overpasses probably saves some lives. 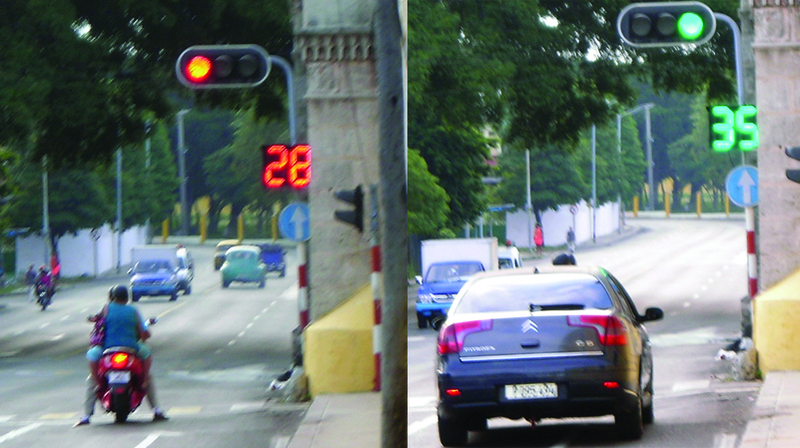 Something I really liked in Cuba was how traffic lights work. Every side has a countdown, for both drivers and pedestrians, in green to let you know how much longer the light will stay in your favor, and in red so you know how much longer you'll have to wait. The system seemed to work very well (but people jaywalked anyway). Street "signs", however, were another thing. Instead of a pole on the corner with the names of the intersecting streets, in Havana you see small, square obelisks with the street names on the different faces. 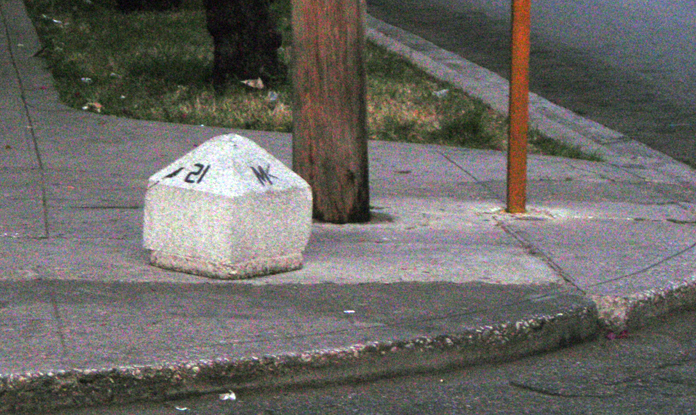 Not only were they difficult to see easily (I can't imagine looking for them while driving), not all of them were in good condition — some were broken, sometimes the street names were missing, and some just didn't have any writing on them at all. An unexpected bit of excitement on our trip was the opening of the U.S. embassy, on Monday, July 20. The event was televised locally and was greeted enthusiastically by everyone we saw. Later that day several of us decided to visit the embassy just to try to look around. We were turned away because we didn't have any official business to conduct, but we took photos outside the building to commemorate the historic event. Visiting Cuba really was a great adventure. I'm glad I had the opportunity to do so, and it's a trip I'll always remember, even though I wasn't able to find everything I wanted to about my family. Only time will tell if I'm being overly pessimistic about what will happen as more Americans travel there. I hope I'm wrong, because I would like to go back again some time and try my research again.